As much as I love a weekend camping getaway, sometimes you just need a break from pitching tents and roughing it. Glamping is the perfect way to still immerse yourself in nature without sacrificing too many modern conveniences. You’ll swap that bougie hotel room or rustic campsite for pimped out treehouses, tipi getaways or art-deco caravans. The best part? You won’t lose out on any of the incredible views, and some wildlife might even join you for breakfast. 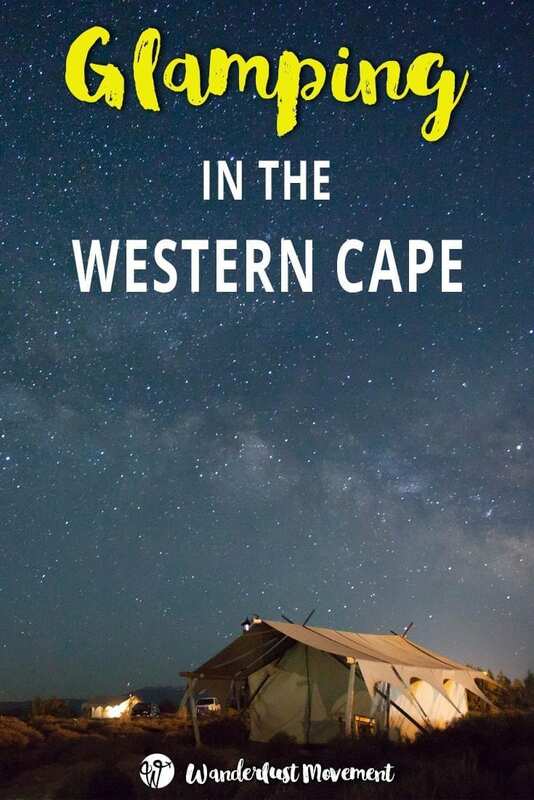 If you want to do something out of the ordinary and treat yourself to a luxury wilderness experience, then pack your bags and head to one of these unique glamping spots in the Western Cape! 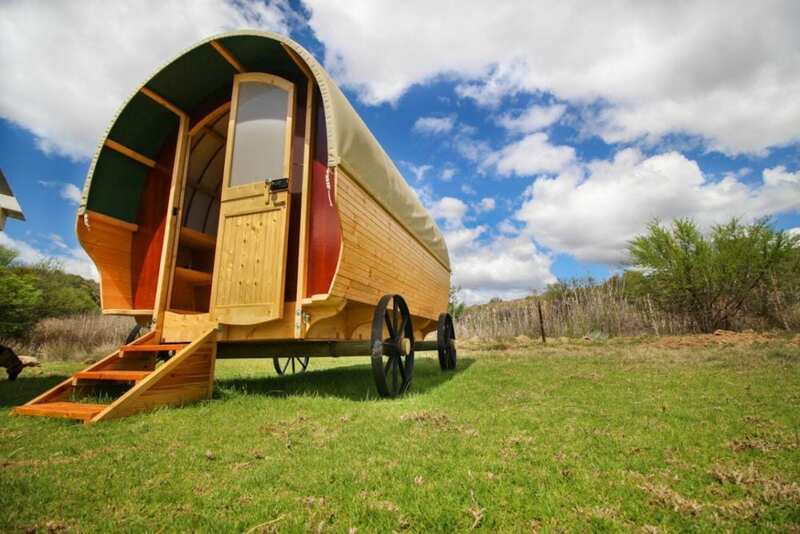 Have you ever stayed in a hand-made gypsy wagon? 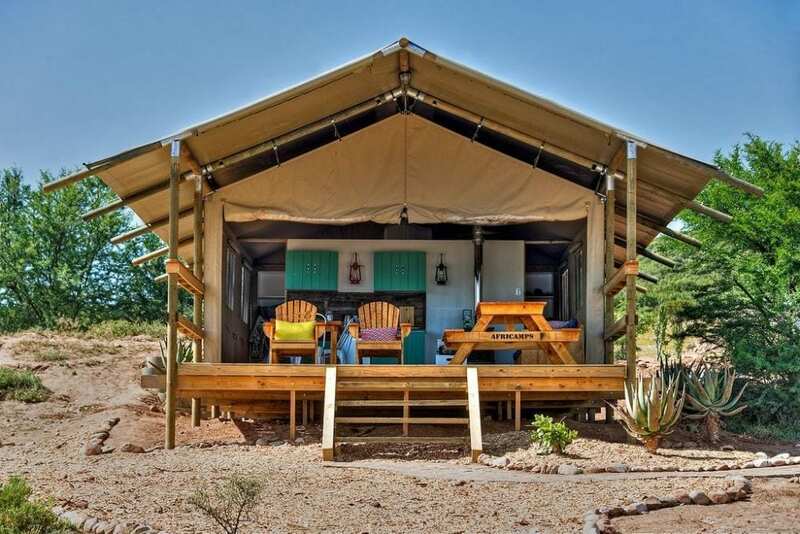 Located along Route 62, Glen Eden Farm is the perfect getaway for travellers that want a glamping experience in the Western Cape with a twist. Inside the wagon, you’ll find a queen size extra length bed. Outside is a private pod with a bathroom, shower, a small kitchen and a stoop. There’s also a braai area and a fire pit, giving you everything you need for a weekend break from the city. Visit the Montagu Hot Spring. Go spend the day at the Gouritz Cluster Biosphere Reserve. Explore the nearby hiking trails that weave through the mountains. Pick up some local goods from the Montagu Village Market. Get an adrenaline rush by tackling some of the rock climbing routes. R 800.00 (1-2 People) per night and + R 250.00 per additional person. Winter (Mid June – End August) R 700.00 (1-2 People) + R 200.00 per additional person. Africamps is one of the hottest glamping destinations in South Africa. With locations around the country, you could plan an entire road trip visiting each campsite. But if you’re looking to experience some of South Africa’s natural history with a dash of luxury, head to their Klein Karoo destination. Located on one of the biggest Ostrich farms in Southern Africa, you’ll be in prime position to spot the areas free roaming game. Plus there are plenty of activities you can book online to keep you busy while in the area. Organise your itinerary before you leave and plan ahead for a guided tour of the Cango Caves, or explore the Karoo desert and discover the creatures that all this arid place home. Each of the five luxury tents are mini boutique hotel rooms. You’ll find a fully equipped kitchen, ensuite bathrooms and two bedrooms with queen-sized beds. Other amenities also include Wi-Fi, air-conditioning, braai facilities and laundry services. Go on a sunset drive through the wildlife reserve. Go on a 45-minute stargazing tour. Explore the nearby Cango Caves. Escape into the Karoo with a guide and learn about the daily lives of the meerkats. Go hiking and discover the ecosystems that make the Little Karoo tick. 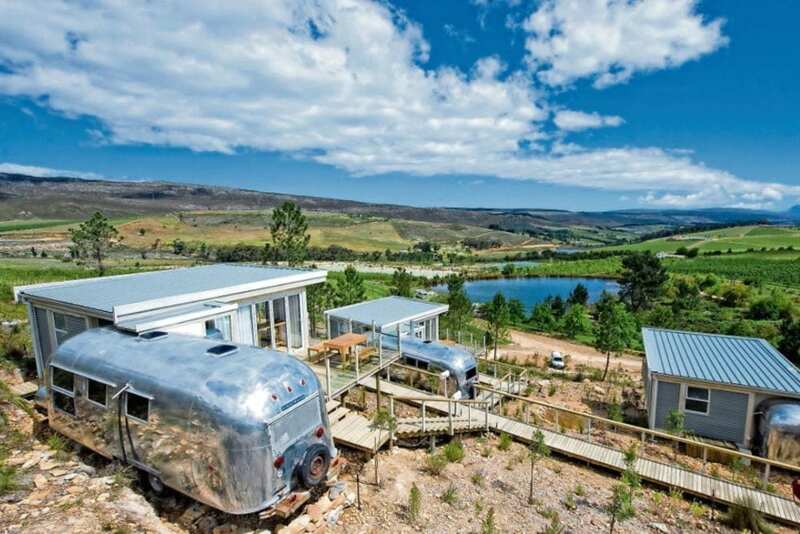 Old Mac Daddy is my favourite Western Cape glamping destination on this list. It’s not every day you can stay in a nostalgic 50’s Airstream trailer that has a wrestling ring around the bed! But if that’s not rustic enough for you, Daddy has you covered with their Hideaway – a glam tent option. Decked out with luxurious touches and incredible views, your every comfort will be taken care of as you retreat into the wilderness. Prepare yourself for a private plunge pool, heated bathtub, free Wi-Fi and a delicious on-site restaurant! Head to the trees and go on a zip line canopy tour. Go on a wine tasting tour through Elgin’s wine region. Tackle the many hiking or mountain bike trails. Try your hand at archery, stand-up paddle boarding or kayaking. Prices range from R1395 to R2095 depending on how many people are staying together. 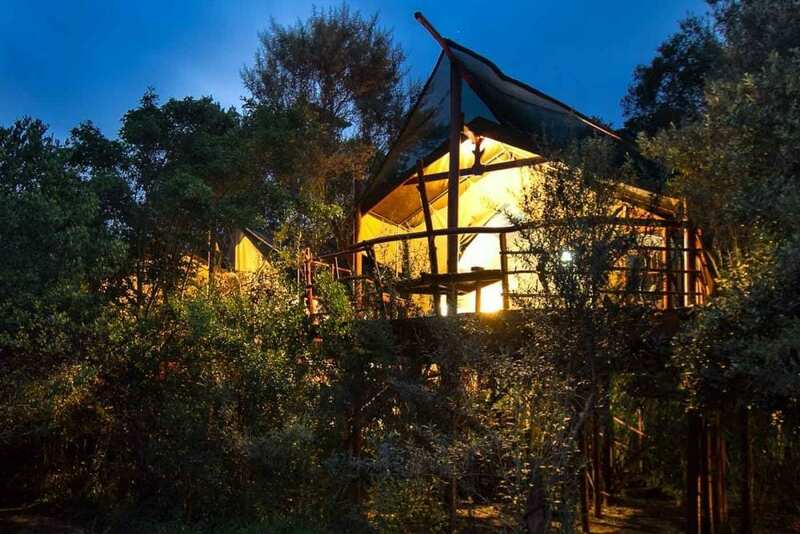 Located along the Garden Route, Teniqua Treetops is a magical Western Cape glamping escape into Knysna’s indigenous forest. Half cabin, half tent and built way up in a tree, you don’t get more immersed in nature than this. Each treehouse is equipped with an enclosed hand-crafted kitchen, beautiful bedrooms and bathrooms with a jaw-dropping view of the surrounding area. But what adds to Teniqua’s magic is that it’s an eco-friendly resort. Teniqua is committed to minimising their footprint and ensuring the long-term sustainability of their forest home. Go on walks through the indigenous forest and swim in the natural pools. See how many of the 100 different varieties of birds you can spot. Work on your tan at Sedgefield Beach. Sign up for the famous Moonlight Meander walk to Gerrikes Point. Tackle the 30km of mountain bike trails. Prices range from R1320 to R1958 per unit and units can either sleep 2 or 5 people. Want more Western Cape glamping inspiration? Or want to see what the rest of South Africa has to offer? Check out Glamping Hub for an updated list of the best spots in the country!